Discussion of specific biotechnology approaches being taken to improve commercial biofuel production. There has recently been increasing interest in using genetic engineering or other advanced biological technologies to improve the plants that are used as feedstocks for production of ethanol or other fuels. Some efforts are being directed at food crops like corn: even though most observers today consider corn ethanol to be a transitional fuel, the techniques for genetic engineering of corn are well known and easily practiced, and there are a number of companies that consider corn to be somewhat of a “model crop” and only a short-term product opportunity. Efforts are also ongoing to engineer the plant species that might be alternative biofuel feedstocks , including trees, switchgrass, oil-rich crops like canola or Jatropha and others. The following is an overview of some of the approaches being taken to engineer plants for biofuel use: see Sticklen 2006; Torney et al. 2007; Sticklen 2008; and Weng et al. 2008 for more comprehensive scientific reviews of research in this field. Techniques for genetic engineering of plants have been well-established for over two decades, with the earliest methods for transforming dicotyledonous plants being developed in the mid-to-late 1980s and methods for transforming monocots (including most of the world’s important cereal crops) arriving several years later. In many ways, the methodology resembles the techniques used to engineer microorganisms, but with the added challenge of successfully transporting the exogenous DNA through the plants’ cell wall (a feature unique to plants) en route to the cell nucleus. Among the methodologies to accomplish this are the use of Agrobacterium, a microorganism naturally having the ability to inject its DNA into plant cells; electroporation, in which the DNA is transported into plant cells using electric current; and the “gene gun”, where DNA is adhered to extremely small nanospheres which are shot at high velocity into the cells. Some of the possible technological approaches to using plant genetic engineering to improve biofuel production are summarized in below. The most common strategies for creating transgenic plants for use as biofuel feedstocks have as their goal the introduction of genetic changes into certain plant species to make them more useful for the production of ethanol and other fuels. For example, one might introduce genes encoding key biodegradative enzymes such as cellulases or ligninases into the plants, to enhance the conversion of cellulose into fermentable sugars, thereby improving the pretreatment of cellulosic feedstocks. 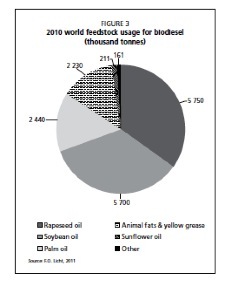 Other companies and research groups are focusing on engineering oilseed crops to have altered or enhanced lipid content, to make them more suitable for production of biodiesel (analogous to strategies used for altering algal strains). Increase plant biomass, cellulosic biomass. Lignin modification to reduce need for pretreatment. Regulated gene expression, so traits are active only when needed. 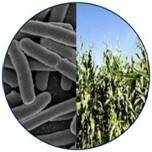 Another approach is simply to engineer or breed biofuel crop species to grow faster and/or create more biomass. It has also been proposed that one might engineer plants, particularly trees, to have reduced lignin content, which might greatly facilitate the pretreatment steps now needed to process cellulosic feedstock into fermentable sugars. One intriguing step towards this goal was recently achieved by a group from Brookhaven National Laboratory, who used protein engineering to alter a plant enzyme that catalyzes the synthesis of certain lignin precursors, so that the enzyme instead produced molecules unable to serve as the building blocks for lignin (this engineered enzyme has not yet been tested in plants). A number of companies and research groups are taking these genetic engineering approaches one step farther, with the goal of using gene expression promoters capable of being regulated so that key degradative enzymes would not be expressed in the plant tissue until the specific time they are needed. In this way, transgene expression would remain silent during the normal growth of the plant, but expression would be turned on during pretreatment or processing or at a similar stage when expression of the degradative enzyme is most needed. Companies pursuing this strategy include Agrivida and Farmacule Bioindustries. Finally, there are also several companies that are developing genetically engineered plants as “factories” for the production of enzymes for use in fuel fermentation. Similarly to companies using microorganisms to produce cellulytic or other degradative enzymes, some of these companies (like Medicago) are ones that are already in the business of creating transgenic plants for the commercial production of enzymes or other industrial products, or pharmaceutical products. One such approach is being taken by the seed company Syngenta, which has received approval in several countries (but not the U.S.) to commercially sell a strain of corn that has been engineered to overexpress an amylase enzyme, for use in biofuel production. Later entries in this blog will discuss the programs and strategies of commercial biotech companies that are developing modified plant varieties for biofuel use. At this writing, I’m aware of at least 15 companies in the U.S. and elsewhere in the world that are actively pursuing such goals. Researchers have investigated the possible use of algae for biofuel production for many years, dating back at least to efforts by the U.S. Department of Energy in the 1970s. These early efforts failed to result in production technologies that were economically competitive with petroleum-derived fuels, and so the field stagnated. However, recent years have seen an increased interest in the use of algae to produce biodiesel and other fuels. Within the past couple of years, most of this renaissance was fueled by news of several big business deals involving algal biofuel firms, particularly the research partnership between ExxonMobil and Synthetic Genomics for development of improved algal strains using synthetic biology. With this renewed interest has come increased activity in the application of biotechnology to improve the strains of algae that might be used in biofuel production, thus providing process improvements that could make such methods economically competitive. I’ll briefly summarize some of the biotechnology strategies that are being used or that have been proposed, again with the caveat that this is cannot be a comprehensive scientific review. Among published reviews are Rosenberg et al. 2008, Li et al. 2008; Angermayr et al. 2009 and Mayfield (undated). Of the three classes of organism that are amenable to improvement for biofuel purposes, algae are the laggards with regard to the development of technologies to enable reliable, stable genetic transformation. A number of algal strains can be genetically engineered, and in fact, engineered algae have long been proposed for use in industrial production of pharmaceuticals and other high value products. But according to Rosenberg et al, “routine transformation has only been achieved in a few algal species” in spite of significant and ongoing progress in extending such techniques to other species. Techniques exist, or are under development, for targeting genetic changes either to nuclear DNA or chloroplast DNA of microalgae species. The biofuel strategy most often contemplated for algae is the large-scale production of biodiesel, jet fuel, and other petroleum-derived fuels. Biodiesel is usually composed of a mixture of fatty acid methyl esters, which can be produced from any biologically-derived source of fatty acids, with the final product created by a transesterification reaction. Mixtures of these esters can mimic the composition of petroleum-derived fuels such as diesel, jet fuel and others, which are complex mixtures of linear and branched hydrocarbons and cyclic alkanes. So, most genetic engineering strategies contemplated for algae involve enhancing or altering natural lipid biosynthetic pathways, to create a mixture of fatty acids suitable for conversion to biodiesel or other hydrocarbon-based fuels. One example (described in Rosenberg et al) is to transform an algal strain to express one or more enzymes involved in lipid biosynthesis – the example given in Rosenberg et al. is the enzyme acetyl-CoA carboxylase, which in early experiments was engineered into an algal strain, albeit with little impact on lipid biosynthesis. It has been reported that Aurora Biofuels is pursuing a similar approach to the enhancement of lipid synthesis in algae. Other approaches to engineering algae are described in the table below. Such ideas include finding ways to enhance the efficiency of photosynthesis in algal production strains (e.g. by engineering the strains to synthesize large amounts of photoreceptor molecules), or to enable algae to utilize alternative food sources, particularly the ability to metabolize and ferment sugars. Solazyme has conducted research in these fields, and has pending patent applications relating to engineering light utilization and to alternate feedstocks for industrial algae strains. One unique approach that has been taken by Algenol Biofuels is to engineer cyanobacteria to express the enzymes pyruvate decarboxylase and alcohol dehydrogenase, allowing the algae to convert the common Krebs cycle molecule pyruvate first to acetaldehyde and then to ethanol, a strategy which the company is beginning to commercialize. Finally, it is also possible that genetic strategies might be used to attack what is a significant problem facing the use of algae to produce biodiesel: the need to separate the lipid products of the organisms from the aqueous medium in which the algae are grown. This often requires costly, energy-intensive physical processes, so that finding a biological method for secretion and sequestration of lipids from microalgae could be a very important development for the biofuels industry. Synthetic Genomics is reportedly trying to accomplish this goal using its synthetic biology expertise. Genetic Engineering Strategies for Algae. Enhance or alter lipid biosynthesis. Enable use of alternate food sources. Enable secretion of lipids to aid oil/water separation. The renewed interest in algal biofuels over the past several years has led to a lot of activity in the field, with many companies operating, building, or announcing plans to build pilot or demonstration plants, many of which might use algae modified using some of these approaches. I’ll discuss the companies in this sector of the industry, their technologies and commercial plans in later installments of this blog. Much of today’s commercial activity using advanced biotechnology for biofuel production focuses on the creation, selection or improvement of strains of desired microorganisms having enhanced properties for functions important for biofuel production. Longstanding methods for producing ethanol or other fuels, generally rely on the use of one or more selected microbial strains to drive the fermentation process. Traditionally, these methods have made use of naturally-occurring or classically selected microorganisms, but in recent years the power of the new biotechnologies to develop enhanced strains is being investigated or used by numerous companies. The following is a brief overview of some of the strategies that are being pursued. This is not meant to be a comprehensive summary of such strategies, and it is well beyond the scope of this blog to try to provide a thorough review of the multitude of published scientific papers describing genetic engineering approaches to improving biofuels organisms. For those seeking more scientific detail, there have been numerous review articles published in recent years, including Dien et al. 2003; Jarboe et al. 2007; Stephanopoulos 2007; Atsumi and Liao 2008; Fortman et al. 2008; Lee et al. 2008; Rude and Schirmer 2009 and Connor and Liao 2009. Overexpress desired enzymes within host fermentation organisms (e.g. to improve ability to process or degrade cellulosic feedstocks). Engineer microorganisms to manufacture novel or improved industrial enzymes for stand-alone use in biofuel production. Create novel or synthetic microorganisms to enable production of renewable fuels. Perhaps the most common strategy employed to date has been the use of recombinant DNA techniques to engineer microorganisms to overexpress desired enzymes, including heterologous enzymes derived from other species which are not naturally found in the host species. This is the strategy most often used by companies developing new microbial strains for cellulosic ethanol production: it would be advantageous from a process perspective to have a single microbial strain that can express the cellulases needed to break down the complex components of cellulosic feedstocks while also possessing the pathways to ferment the resulting sugars into ethanol, but there are few, if any, naturally occurring microorganisms that combine these features. One approach is therefore to introduce into host organisms that are already optimized for ethanol fermentation genes from other species encoding the desired cellulytic enzymatic activities. As another example, genetic engineering could be used to give ethanol fermenting microbes the metabolic pathways needed to utilize sugar sources such as the 5-carbon xyloses and other pentoses that are released from hydrolysis of woody biomass. The alternative approach would be to splice genes encoding the enzymes making up the ethanol fermentation pathway into an organism lacking that trait but having the ability to digest the complex cellulosic components. Strategies like these are being pursued by companies like Mascoma Corporation, Verenium Corporation and others. It is also possible to use genetic engineering simply to enhance the efficiency of naturally-occurring ethanol-producing strains that in some cases already have sufficient activity to be used commercially: an example of a company pursuing this strategy is Qteros, which is moving towards commercial use of a natural microbial isolate while beginning in-house research to improve its activity using biotechnology. A variation of this strategy is to create and use engineered microbes to manufacture novel or improved industrial enzymes, which can then be used as a catalyst in fuel fermentations to enhance or accelerate biofuel production processes. Enzymes like cellulases, amylases, and other degradative enzymes can be used to pretreat cellulosic feedstocks, or can be added to an ethanol production process at any other suitable time. Companies pursuing this strategy are generally companies already manufacturing and selling other industrial enzymes, including several companies having decades of experience in this sector of the industry, such as Novozymes, the Genencor division of Danisco, and others. The field has also attracted some newer players, such as Iogen Corporation and Dyadic International, some of which are devoting a significant portion of their effort to the manufacture and sale of biofuel enzymes. Finally, a more ambitious strategy is to use synthetic biology, metabolic engineering, or other advanced techniques to create novel or synthetic microorganisms possessing enzymatic capabilities not found in the original host organism. This strategy might involve designing an “optimal” organism using combinations of enzymes from other sources, or even completely new enzymes designed and created using protein engineering to have maximal catalytic activity. Strategies like these are most often being pursued to create microorganisms or algae optimized to produce “designer” mixtures of hydrocarbons mimicking the composition of diesel, jet fuels or other petroleum fuels, including efforts by companies like LS9, Amyris Biotechnologies, Joule Biotechnologies, and (in algae) by Synthetic Genomics. However, this approach is also being used to enable more efficient production of other fuels: for example, Joule Biotechnologies is using synthetic biology to create novel organisms that use photosynthesis to produce ethanol and other transportation fuels from sunlight and carbon dioxide without the need for a biomass feedstock. I’ll have more to say about these and other companies in later installments of this blog, when I focus on specific sectors of the industry and the technology strategies being pursued in each.